What should be done about deficits? We’ve written about the problems with company pension schemes before, but the recent collapses of BHS and Tata Steel – and the potential transfers of their schemes into the UK’s pension protection scheme – have brought the subject back into the newspaper headlines. As most readers will know, there are two kinds of pension scheme – defined benefits (DB) and defined contribution (DC). The former is the old-fashioned “gold-plated” pension, where the employer tells you how much they will pay you in retirement, and they (theoretically) take the risk of putting aside assets and growing them to provide the income you will need. In the private sector these have been mostly closed to new entrants, though they still survive in the public sector. They only closed recently, though (over the last 20 years), so there are still plenty of active (drawing a pension now) and deferred (eligible for a pension in the future) members in them. The latter is the normal pension today. The employer and the employee both put money into the pot each year and whatever’s there when you retire can be converted into an income (via drawdown, or less efficiently, through an annuity). A further complication is that most of the DB schemes are “final salary”. This means that the income paid out in retirement is linked to the last salary you had at the company (which is usually the highest salary you were paid). The amount you are due would usually be a 60th of your salary for each year you worked at the firm (this was originally chosen so that 40 years of work earned you two-thirds of your salary). Thus as your salary rises each year, the amount of money you are entitled to (from previous years, not just the current year) also increases. This means that companies have to make additional contributions for previous years, to keep the pot big enough. This doesn’t happen with DC schemes – once the contributions are made for a particular year, they will never be revisited. The problem with DB pensions is that they were mostly funded in different times. Interest rates were much higher. Life expectancy was much lower. These factors combine to make the assets in the pension pot less able to provide the promised income. The difference between the assets in the pot and the assets that would be needed to provide the required income – under today’s conditions – is the pension deficit. 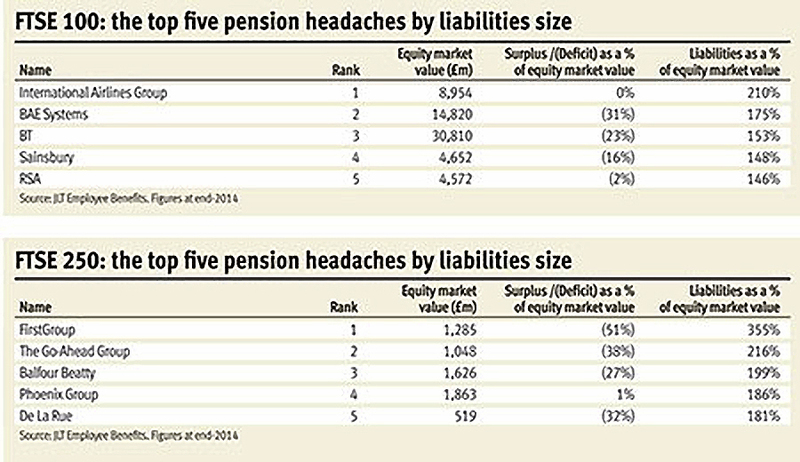 So you might see two figures for the same company’s pension deficit. The same is true for companies managing a shared pension pot on behalf of their employees. 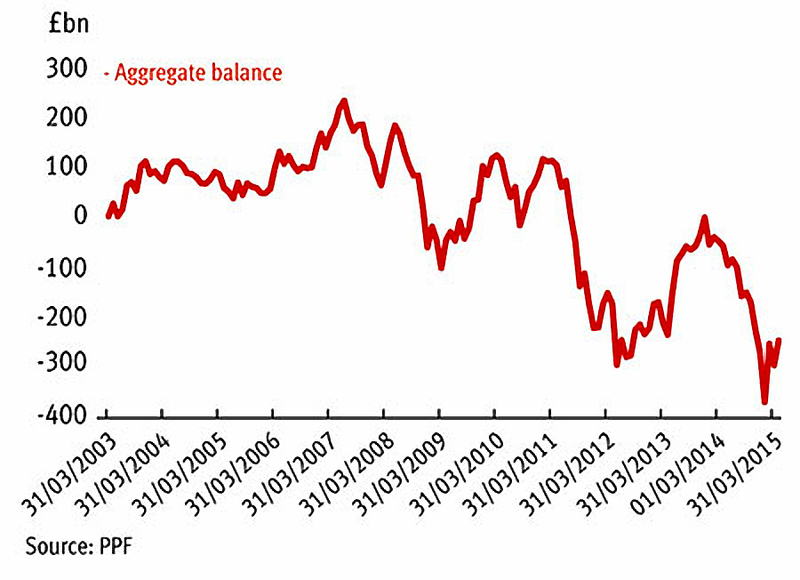 As the deficit in a scheme grows, the risk of default increases. Eventually a deficit may cause a company to go bust. Or the company may go bust for other reasons. 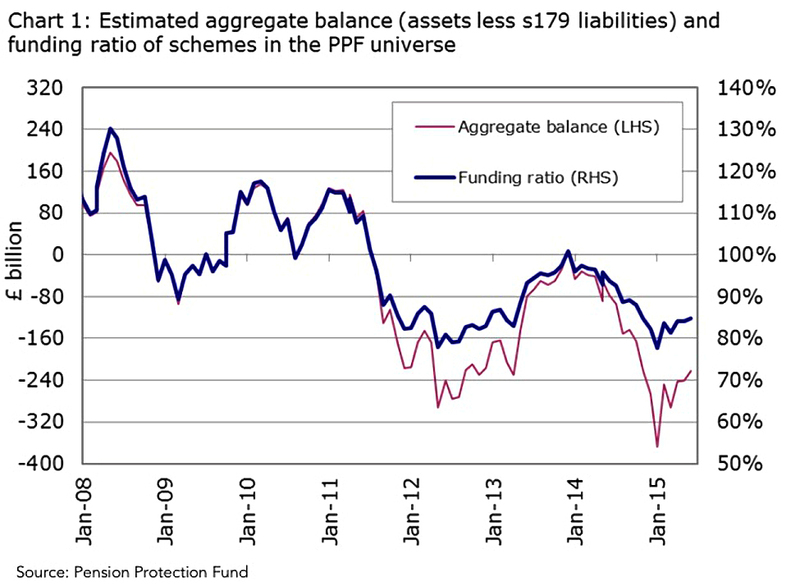 The PPF is funded from a levy on underwritten schemes, and if it runs out of money then it can reduce payments or lower the indexation. Members who are worried that their scheme might collapse can transfer their pension out into a SIPP. This is generally a bad idea, but is an option when the scheme is at risk. Note also that with historically low interest rates and bond yields, transfer values are very high at the time of writing. The first approach is to look at what companies are actually doing. This is essentially to put together a plan to contribute more each than is absolutely required by the changes in the number of scheme members and their changes in salary. Over a period of time, the deficit should clear. Alternatively, companies can pay an insurance company to underwrite their scheme, or even to take it of their hands entirely. There are also solutions that are not being used by employers, such as changing asset class mixes and valuation benchmarks. The recent pension freedoms should also help, as some DB pensioners will transfer out early to DC pensions to access the freedoms. There could also be savings if schemes switched from RPI to RPIJ (which averages 0.7% pa lower). And there have been proposals (as in the Tata Steel collapse) that companies should be able to reduce their obligations to pensioners in order to reduce their deficits. We’ll look at all these options in a future post. From an investor’s perspective, diverting extra assets in to the pension scheme will affect cash flow and investment in the business itself. Dividends might also be affected. The figures reported by the various pension analysts tend to be different, so we have plenty to choose from. But few of them are good. PWC’s 2015 survey found that pension schemes were taking longer to clear their deficits. 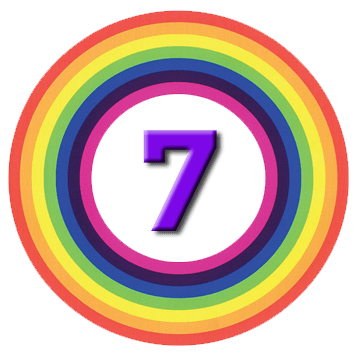 71% of the 213 companies they surveyed – with combined pension scheme assets of £180 bn – had lengthened their recovery plans by three years of more. The average target date for recover was 8 years, though some plans ran for 25 years. They also found that 30% of firms were targeting a buy-out from an insurance firm, and 16% were planning to match cash ouflows by holding “high-quality” bonds. 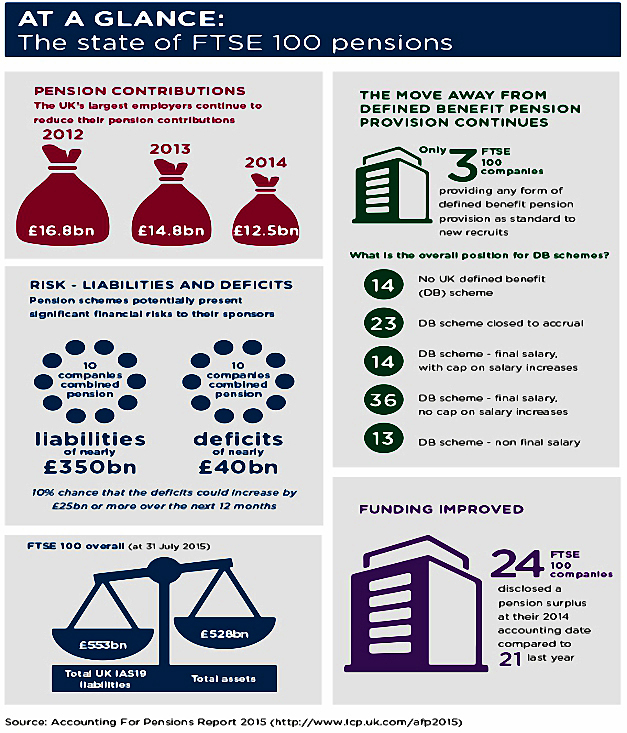 LCP’s 2015 report “Accounting for Pensions” (AFP) on FTSE-100 companies found record liabilities but a fall in contributions. Hymans Robertson reported that the total shortfall for the private sector (including unlisted companies) had more tripled over 15 years to £900 bn. JLT Employee Benefits reported in May 2016 that total liabilities for private sector pension schemes were £1.57 trn, with defcits at £310 bn. 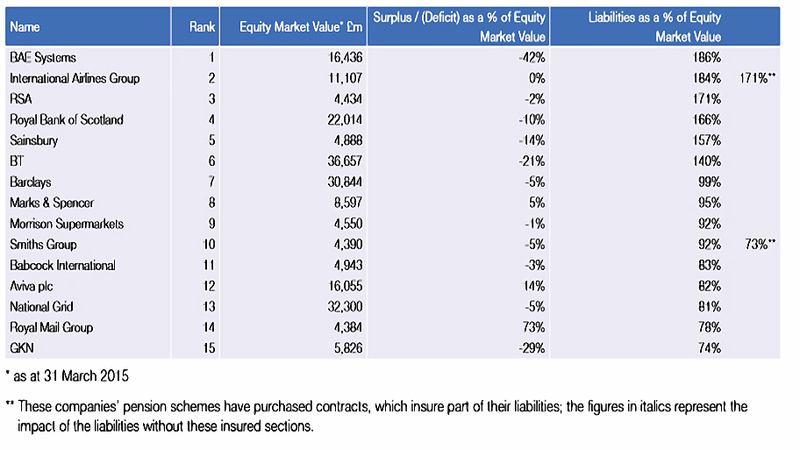 In a rare bright spot, Mercer’s Pension Risk Survey from February 2016 – which looked at FTSE-350 schemes, about 50% of all UK pension scheme liabilities – shows a slight decline in deficits, though liabilities continued to increase. Barnett Waddingham found that in 2015 FTSE-100 deficits fell by £15 bn, as employers reduced estimates of future salary increases and used higher discount rates (3.8% vs 3.6% in 2014, from higher corporate bond yields). We’ve about run out of space for today. With so many industry reports covering different sectors of the pension universe, it’s a complicated picture. 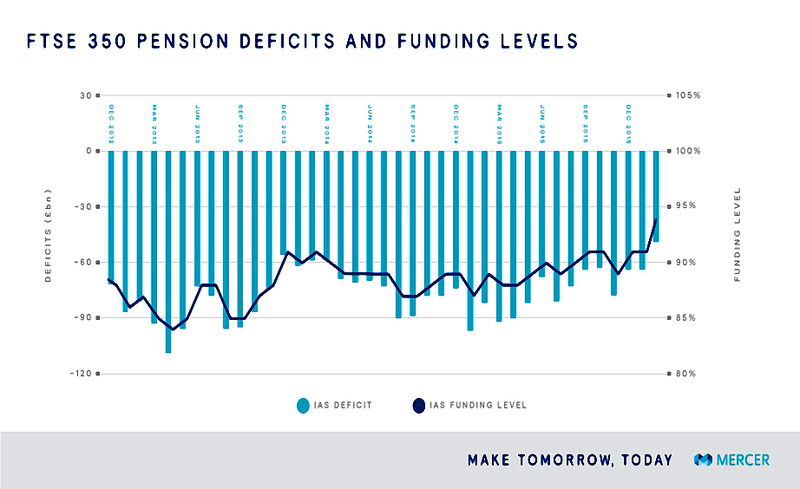 But it’s safe to say that pension deficits are a real problem in the UK. In future posts we’ll look at what they mean to investors and to pension scheme members, and we’ll analyse in more detail what could be done to fix them. 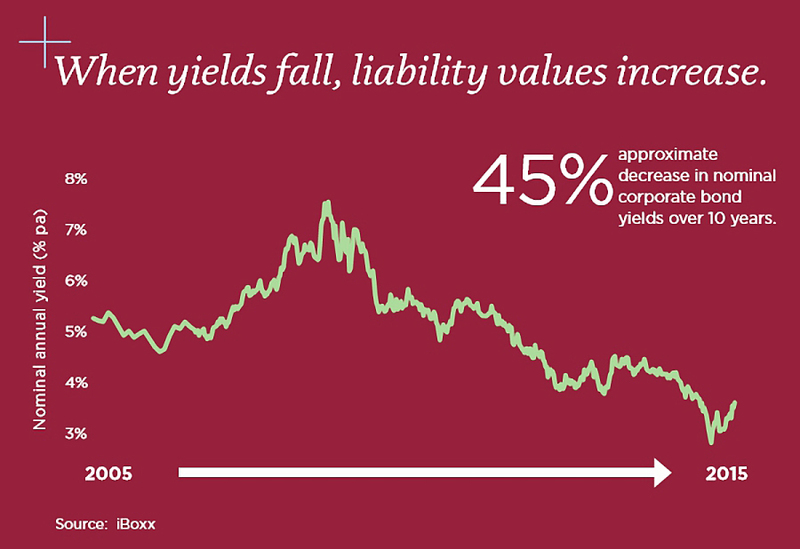 This will include an analysis of return and liability assumptions, and what could be done to make them more realistic. We’ll also provide case studies on some of the more interesting recent pension scheme events, such as BHS, Tata Steel, Aga, RSA and Thames Water.